We live within the midst of perpetual suffering and death. While the animals’ cries may be strategically concealed behind metal bars and concrete walls, their pain is as real as yours or mine. When you see the slaughter truck, remember that the best thing you can do for the creatures inside is refuse to eat their flesh. For animals being transported to slaughter, the green mile is long, treacherous, and laden with suffering and death. While often deprived of food and water, these sentient beings are exposed to the most extreme weather conditions imaginable. Their journey to slaughter, or to feed lots to be fattened, can span across several hundreds of miles. 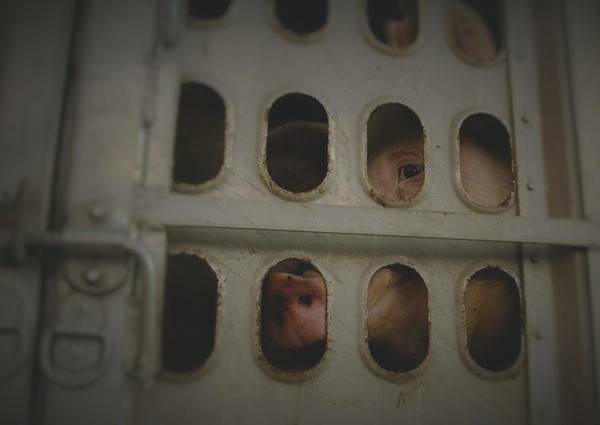 These hapless animals are often beaten and forcefully prodded onto the death trolley known as the slaughter truck. They’re packed so tightly together that many succumb to severe emotional distress and suffocation. Thousands of them die before being unloaded. The survivors will receive a bolt gun to the head, or a blade to the throat, as their welcoming gift to the slaughter house. It’s unfortunate to think that the only time these animals receive regulated temperature conditions during transport is when they’re processed in the form of meat. When these creatures are alive, they’re forced to withstand the blistering heat of summer, and the biting cold of winter (including windchills of up to -50 degrees). Thousands of animals either die in route to slaughter or are so devastatingly weakened that they cannot stand on their own. These animals are referred to by the agribusiness as “downers.” Animals are subject to panic, severe depression, heat exhaustion, heart attacks, frost bite, and hypothermia. Disturbingly, it’s common for some animals (especially hogs) to literally stick to the sides of the truck as their skin freezes to it. These animals are pried from the truck with crowbars or shovels. In addition to temperature conditions, animals are often killed as a result of accidents. These can occur as a result of vehicular collisions, inclement weather, or reckless driving. When the slaughter truck carrying animals is struck, animals aboard can be severely injured or even killed. Their bodies often plummet out of the vehicle and onto the pavement. A spokesman for a major meat producing company, Smithfield Foods, noted that this “happens all the time.” Because health and animal-welfare regulations for animal transportation are limited and poorly enforced, these accidents are seldom seen more than monetary losses. Every night and every morn, some to misery are born. Every morn and every night, some are born to sweet delight. Some are born to sweet delight. Some are born to endless night.